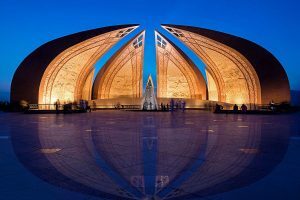 The Pakistan Monument is a national monument and heritage museum located on the western Shakarparian Hills in Islamabad, Pakistan. The monument was constructed to symbolise the unity of the Pakistani people. Its elevation makes the monument visible from across the Islamabad-Rawalpindi metropolitan area and is a popular tourist destination.